← Get Outta Here Ya Turkeys! offee beans? Nope, black beans. This is the second year that we’ve grown them, mostly just due to curiosity. My parents like to flip through the seed catalogues and consider trying to grow things that they haven’t before. This year we grew chickpeas and soybeans for the first time. 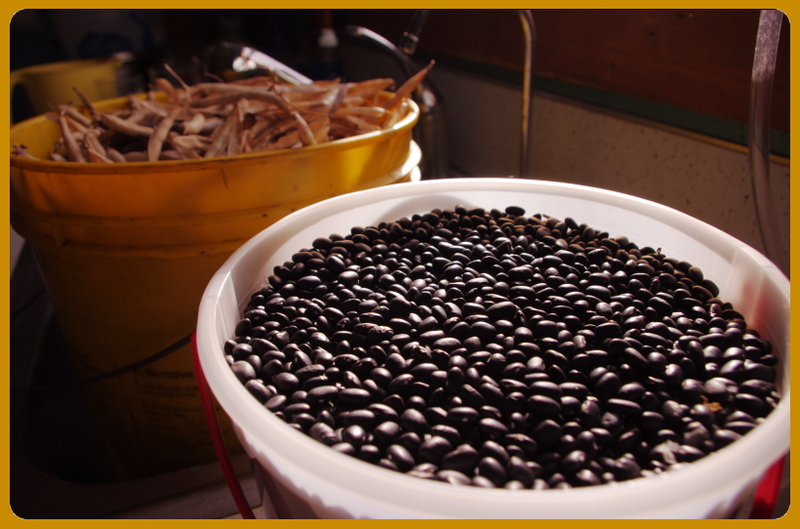 Growing dry goods like beans, feels like a lot of effort for not enough product, especially when beans are cheap! After picking green beans and zucchini, for example, every few days off of the same plants for months, letting a plant work all season long on a few dry beans, seems disproportionate. When we were picking the pods, I told my mom it seemed a bit nuts to be growing black beans. We picked three 5-gallon pails of bean pods yesterday out of about 60 feet of plants, and the ice cream pail you see full of shelled beans, is from 2 of the 3 pails. However, I found shelling beans to be satisfying work, and I really enjoyed the smooth, round, pitch-black beans that pop out like pearls. Despite the time it took to shell them, when we finished, I marveled at the simple fact that our ice cream pail of beans was food that wouldn’t rot. Fresh summer produce, even in the fridge, only lasts so long, and I imagined how I would feel about the beans if I didn’t have a fridge or a grocery store. Our small haul of beans makes me feel rich like a squirrel might feel after burying more than enough nuts to get himself through the winter.